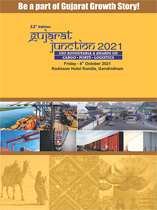 EXIM INDIA takes pride in announcing the 11th Edition of Gujarat Junction 2020 CEO Roundtable on Ports, Shipping & Logistics, concurrent with Gujarat Junction 2020 - Cargo and Logistics Awards on 20th March 2020 at Radisson Hotel Kandla, Gandhidham. So, join us at Gujarat Junction 2020, to discuss, deliberate, honour and celebrate excellence in the maritime, cargo and logistics sector. You can also be a partner to this much-awaited event and expand the horizons of your knowledge and business. It will be an occasion to learn, appreciate, savour and network.